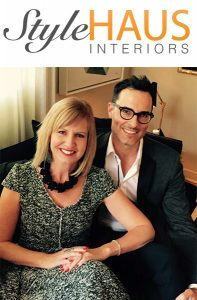 Located in downtown Ottawa in a charming heritage building, StyleHaus Interiors was started in 2010 by designers Denise Hulaj and Jason Bellaire. Their formal studies complement over 30 years of practical experience in renovation of homes and interior design. Together, they create beautiful living spaces for their clients that incorporate personal style and close attention to detail. HF: Denise, how would you deﬁne StyleHaus Interiors’ design style? DH: I have a design aesthetic that is classic contemporary with an eclectic touch. I believe homes should reflect an individual’s interests and experiences—collected and curated with a touch of whimsy! I have a particular love of cottage design. Jason’s personal design aesthetic tends toward the classic with a love of architectural detail. He oﬀsets this with punches of color, sculptural furniture, contemporary art pieces and lighting. Jason believes that a well-designed home can improve happiness and well-being. We create designs that reﬂect our client’s personal style, personality, and are respectful to the architecture of the home. HF: Your Manotick Custom Home project is gorgeous. What are your favorite features of this project? DH: Our favorite features of the home are the backlit Onyx bar in the theatre room, the wall-hung vanities in various bathrooms that are wrapped in slab porcelain, and the Hubbardton Forge light ﬁxtures we used throughout, especially the Quill Pendants in Theatre Room. We also love the reclaimed elm ﬂoors. HF: What were some of the “must-have” requests from the client on this project? DH: Quality finishes and fixtures. Our client understood the need for some strategically placed wow-factors, while also maintaining the desire for a coherent, comfortable and timeless space. HF: How did Hubbardton Forge come to be included in your lighting choices? DH: We’ve been fans of Hubbardton Forge design and quality for years. Quite frankly, the pieces we selected were simply perfect for the spaces they occupy in terms of finish, craftsmanship and unique design. HF: What projects are you working on currently? DH: One of our most exciting projects currently is the full renovation of an early 20th Century Tudor home. We chose the Hubbardton Forge Corona Large Pendant for the dining room, set over a contemporary Italian dining table, surrounded by gold and black peacock wallpaper. Stunning! HF: Any advice you can oﬀer to aspiring designers? DH: Do what you love and love what you do! Take some business courses to learn the operations side of running a design ﬁrm— they don’t teach that in Design School. Finally, never stop being curious! DH: An Italian Villa, a 17th Century British or French manor home, or an uber-contemporary glass and steel beach house!